The German trade account surplus widened in May after narrowing in April. At a level of 20.3 billion euros in May, it is above its 12-month average which lies at 20.0 billion euros and quite close to its previous 12-month ago 12-month average of 20.5 billion euros. Germany’s trade surplus is massive and Germany is taking NO steps to reduce it. Arguably, the German strategy of running a fiscal surplus is intended to restrict growth and imports and maintain the current account surplus as well. German export and import patterns are without strong trends. The graph shows that both exports and imports have slowed their growth based on year-over-year trends. Since that slowing, growth rates have hovered more or less trendless at low rates of expansion. With May data incorporated, the sequential patterns (12-month to six-month to three-month) show a revival in exports over three months after staying weak in the previous sequential periods and that is more or less the same for imports. The revival is wholly a function of the May trade report. The table also includes export and import headline trends lagged by one month to allow comparisons of overall growth with commodity details that lag by one month. Lagged overall exports and imports through April do not demonstrate any revival for the two headline series. But add in May and that changes abruptly. Details on goods trade through April show that exports are weak or declining across most sequential time periods and most commodities. 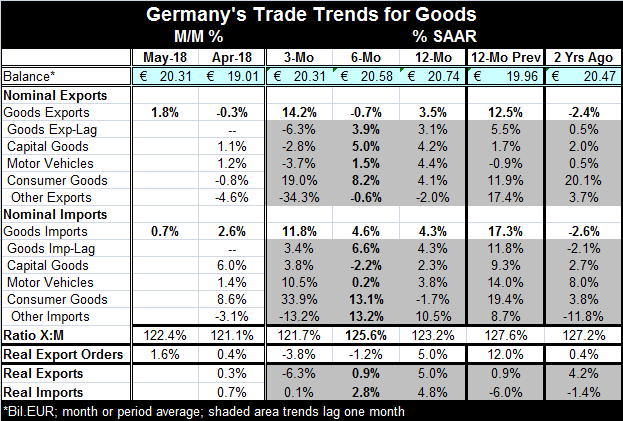 Consumer goods are an exception as German consumer goods exports show strong growth over three months (19% pace) and accelerating growth from earlier horizons. But consumer goods stand alone in that respect. Imports show more or less steady but slow growth overall across the sequential horizon with capital goods mimicking the headline gains while motor vehicle imports are strong over three months and consumer goods imports gather pace steadily and rise at a very sold 33.9% annual rate over three months. But ‘other imports’ fall at a 13.2% pace over three months. On balance, the commodity composition trade detail is simply idiosyncratic and does not really help us to understand overall trends. And then, of course, there is the added problem that these data lag and based on results for May for the headline both exports and imports show much more life on data that are just one month fresher. What a difference a month makes! Real export orders show declining and decelerating growth rates over the sequential horizon. Real export orders slip from a 12-month growth rate of 5% to a three-month annualized pace of -3.8%. That is not encouraging. Meanwhile, both real export and real import sequential trends (once again on lagged data) show decelerating flows for both. Over three months, real exports are falling at a 6.3% pace while real imports are gaining at the most inconsequential annualized pace of 0.1%. Germany’s trade surplus remains stubborn. This measure is a living testament to the U.S. case that Germany does not trade fairly. Under free trade without manipulated exchange rates, the exchange rate is supposed to move to eliminate a surplus or deficit, not allowing it to remain and expand over a decade or more. Germany has not seen a trade deficit in more than 27 years. The U.S. has not had a monthly (Census-basis) trade surplus in 36 years. And this is important because one nation’s deficit is another nation’s surplus. Countries that run surpluses in their current accounts (as Germany also does) and do so as a matter of policy, condemn somebody somewhere to run a matching deficit or for those deficits to be shared across other countries. More problematical is that the EU Commission has in place a set of rules that require nations to restrict external surpluses to not exceed 6% of GDP. Yet, Germany flaunts this rule year-in-and-year-out and still holds other countries’ feet to the fire of the deficit and debt rules compared to GDP. Why is that? German current surpluses actually do hinder fellow EMU economies. But rules that affect Germans are not enforced. I guess they have a get out of Post WWII rules free card. On balance, German trade trends are moving sideways. There is a hint of trade flows slowing, but then the May data seem to reverse that. Still, a separate series on German real export orders does show weakening on up-to-date observations. China is in the news today, blaming the U.S. for crushing global sentiment with its trade war. Well, maybe so. But maybe also if countries like China and Germany were more open-minded and flexible about seeing their own contributions to trade that is unfair, the U.S. would not have to hit them over the head with a stick to get their attention. As always, time will tell how bad things will get. However, not even history will tell who is to blame. That will always be up for debate.